Not only has the entry-level Fuji Touring had a big revamp, but a new premium disc brake model enters the range. While the base model is designed to offer that bargain price point, the 2018 Fuji Touring Disc is ready to compete with the more renowned touring bike models. Fuji have stuck with a steel frame and fork for their top model, most notably modifying the frame to accommodate disc brakes. But the 2018 Fuji Touring Disc is not just about adding disc brakes, it has some nice high-end touring parts throughout. 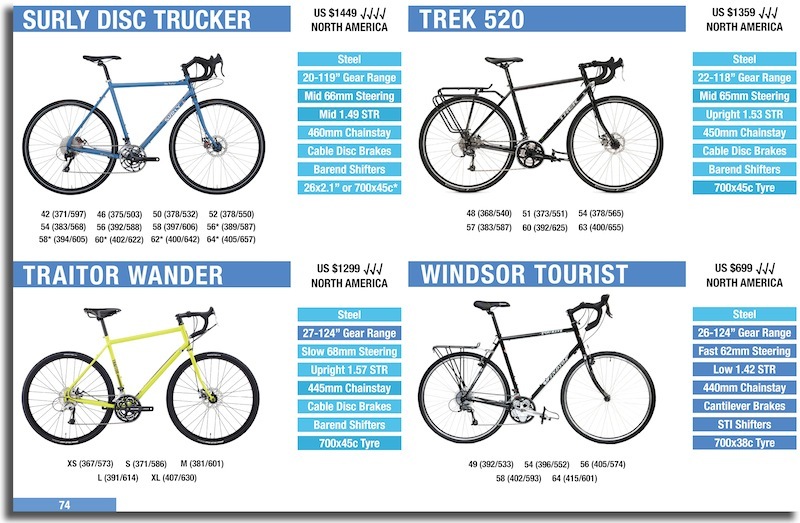 With a US $1299 sticker price, the 2018 Fuji Touring Disc is pitched against some of the best touring bikes in the game, namely the Marin Four Corners (US $1039), Specialized AWOL (US $1200), Trek 520 (US $1359), Surly Disc Trucker (US $1449) and Kona Sutra (US $1499). 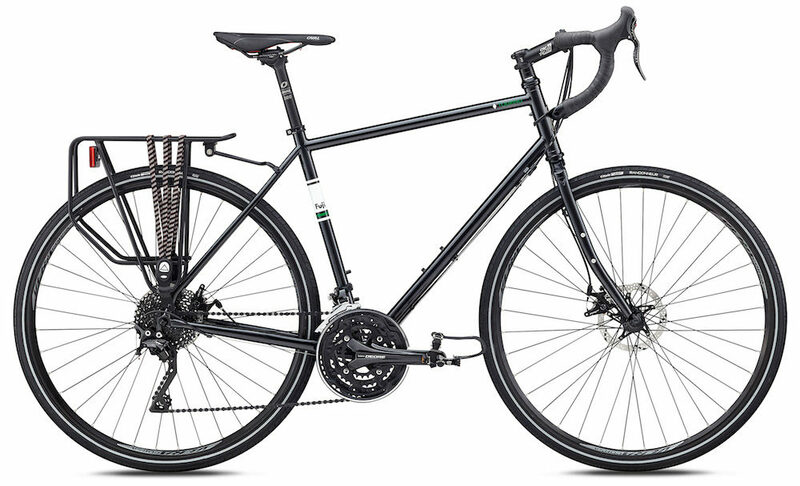 The all-new steel frameset is available in seven sizes and should accommodate most. 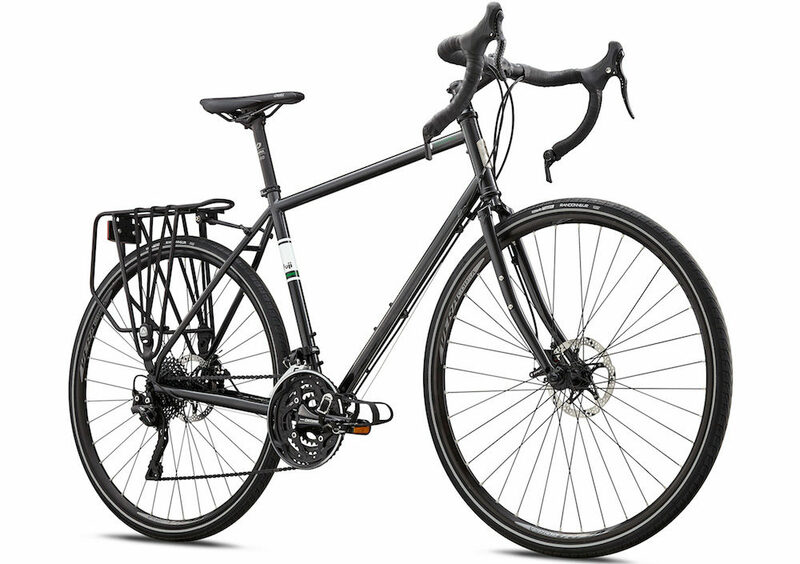 It has a revised geometry which incorporates a long wheelbase, slack head angle, and big fork rake, making the bike great for those long days in the saddle. 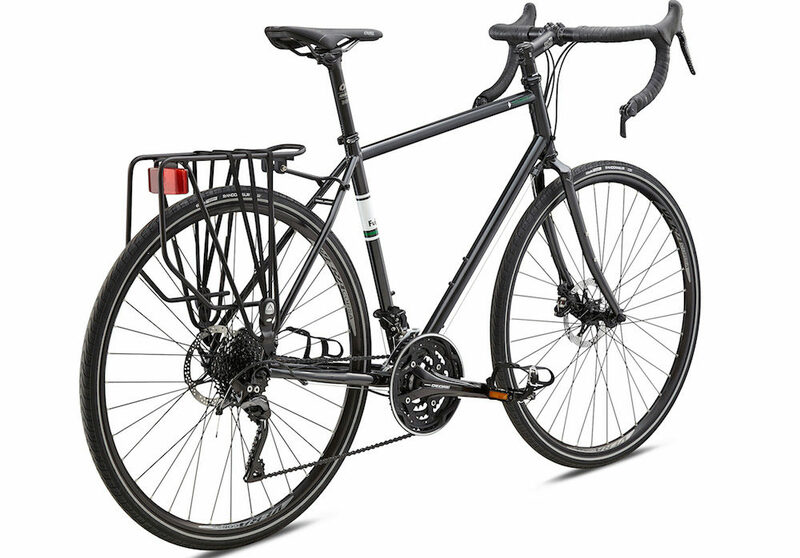 The frame has three bidon mounts in and around the front triangle, and the fork can fit cargo cages or a front pannier rack. The bike is, of course, ready for you to fit up some decent fenders too. The 2018 Fuji Touring Disc is using a Shimano 10-speed drivetrain which is matched to a set of barend shifters. The Shimano Deore touring crankset has both big rings for the flat as well as a small 26t ring for the hills. Up the back is a Shimano XT touring-specific derailleur (T-8000) and a big 11-36t rear cassette. This brings the lowest gear on the bike to a shade under 20 gear inches, resulting in the Fuji Touring Disc having one of the smallest climbing gears on any touring bike. The tyres are a model called the Vittoria Randonneur. These are some of the most puncture-resistant tyres available but have also been tested to be one of the slowest rolling. If you wanted a bit of free speed, take a look at switching them out to the Schwalbe Almotions. Not only will you go faster with the same energy, but you’ll be able to go wider too. The brakes can’t get any better for touring. They’re cable-operated disc brakes by TRP which are super easy to maintain, allowing you to lubricate and swap out the brake cables with ease. The TRP Spyre calipers offer tonnes of power too – while almost all cable disc brakes stop using one piston, the Spyres pull both pistons in to give that hydraulic brake feel. Fuji have opted for the new flat-mount caliper standard, which future-proofs the bike more than others and looks pretty neat. As the disc brakes come with a bit of a weight penalty, the 2018 Fuji Touring Disc weighs 13.46kg (29.6lbs) according to the spec sheet, adding just 380g (0.8lbs) over the base model. This is a worthwhile exercise as disc brakes are unrivaled when it comes to cycling in the hills. That said, the biggest advantage to disc brake is in wet conditions when they can slow the bike down as if it’s dry.